As the influence of biology in contemporary societies is increasingly present in multiple aspects, the acquisition of a basic solid theoretical knowledge is central to the formation of Biologists. This Course reflects this concern by providing a broad theoretical framework in key areas of biology. The faculty is specialized in multiple areas of biology and is integrated in the MARE Research Unit. This Research Unit of Marine Sciences, which was rated highest (Excellent) in the latest assessment of the Foundation for Science and Technology (FCT), stands out on the national scene for its work in marine biology, conservation biology, behavioral endocrinology, and genetics applied to the research of evolution and animal behavior. The course also has the support of the Center for Biosciences whose activity is directed towards the provision of services, education and training in Biology at various levels. The study program is a 1st cycle in Biology equivalent to a Licenciatura (BSc) degree with a duration of six semesters and 180 ECTS. It aims at enabling graduates to acquire the skills and theoretical knowledge required in all fundamental areas of biological sciences. Additionally, it also provides studies in key disciplines for the understanding of biological processes, namely, mathematics and statistics, biophysics and biochemistry. Finally, a degree in Biology is not complete without a solid understanding of the scientific research process in all its components: research planning and design, data collection and analysis, critical evaluation of hypothesis and development of processes to test their validity. One of the inputs of this degree to our cultural and scientific panorama arena is the involvement, from the beginning, of students in projects of initiation to scientific research which, while adapted to their level of knowledge, will allow them to meet real life problems associated with any scientific research project. This is materialized by an extensive field and laboratory work program where student will design small research projects which will evolve and become more complex as they progress in their studies. To meet this aims, the degree is organized in six semesters, 30 ECTS each, with the last semester entirely devoted to the elaboration of a complete research project and one field course. In each second semester, there is a course on initiation to scientific research. University higher education – Level 6 (National Ranking of Qualifications, Decree 782/2009 28th July). When completing this 1st cycle in Biology, graduates are able to access further studies on any area of the Biological and related sciences, namely 2nd cycles of studies of a higher education degree. 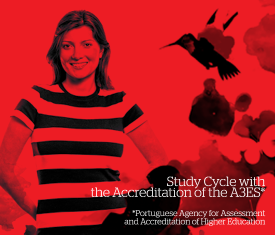 The licentiate’s degree allows access to 2nd Cycle studies, according to the conditions stated by NARIC (National Academic Recognition Information Center). To graduate the student must complete the 180 ECTS successfully.